If you’re serious about eliminating binge eating, food addiction, and emotional eating for good, you have to learn how to change the number one thing that has kept you from doing so so far. Several of my customers have confided to me that they had tried and tried to stop in vain, sometimes for years, only to feel more frustrated and desperate than ever after. They tried dieting, fasting, journaling, affirmations without the slightest long-term improvement. Sometimes they would do better for a while, but somehow they would always end up sabotaging their efforts or give up. If you’re serious about beating binge eating and feel like at the end of your rope, the information below can bring you a huge breakthrough. Why You Have Been Food Binging and Overeating Against Your Will? By observing my addictive patterns–smoking, procrastination, obsessive thoughts and so forth–I’ve come to realize that they were all serving a purpose: keeping me safe. I also became aware of my internal programs. I detected those specific events would trigger an emotional response and activate its corresponding program or survival strategy. For example, I completely obsessed on small details when I was trying really hard to deny that my marriage was broken and that nothing I did could fix it. I would spend hours compulsively doing research to keep my mind away from what I didn’t want to see. That was a strategy not to experience the pain of a shattered marriage. Now, looking back at this strategy, I think it was the least efficient one I could have taken, but my internal program felt it was the best thing for me to do. The same thing holds true for beliefs. I used to think it was safe for me to keep myself small. I have observed my feelings and thoughts around that belief with a special inquiry technique I have perfected. I concluded that that belief was irrelevant and based on false evidence. Nonetheless, the belief that something bad would happen to me if I shunned my light was so big that I couldn’t try anything without experiencing some form of panic attack. My mind would do anything to distract me from my goal, keep me feeling drained of all energy. It was quite horrible. It was some program or some part of me that had learned just to play dead and wait instead of taking action to feel safe. Each of us has unconscious strategies that are meant to keep us safe but instead usually keep us hostage to past conditioning. If you’ve been struggling with compulsive eating, you have probably created your set of beliefs and unconscious strategies. 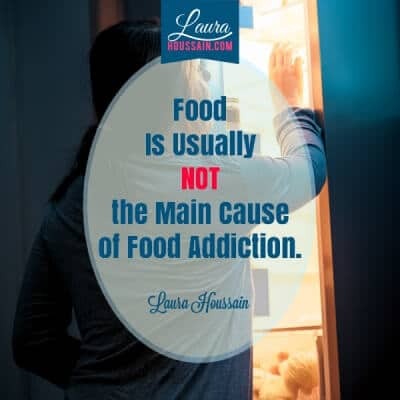 If you are serious about getting rid of your food addiction or binge eating disorder, you’ll have to bring them to consciousness and program new beliefs and strategies that better serve the person you want to become. I know you may have heard that if you change the way you eat, you will end your binge eating and that will be the end of your problems. Scientists tend to disregard the power of mind over matter and say that, if a substance is addictive, remove the substance and that will be the end of your addiction. For emotional eating and overeating, it’s foods like sugar that are shown to be the culprit. Having recovered from numerous forms of addictions, I can acknowledge that a substance can be addictive. 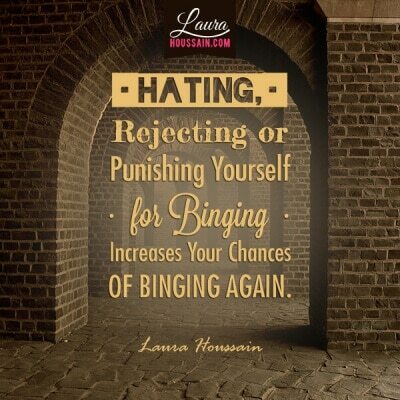 But trying really hard to stop taking it is the least efficient and the most debilitating way to stop binge eating. To me, the substance is not the cause of addiction. It’s just a means to an end. It’s your internal filters, how you perceive the World, yourself, and others. It’s also the unconscious loyalties, promises, or agreements with loved ones you may still be fulfilling today. All the choices that you have made in the past define the choices you make unconsciously today. For example, I know someone who felt it was safer to be obese and feel like a member of his obese family rather than being the abnormal thin child. I know someone else who believes she can’t have the things she wants in life because her parents conveyed to her that it was not for them, so she started overeating to get a sense of satisfaction. If you try to go against your internal beliefs, old programs will do anything to keep you safe in their own terms. That’s usually when you say you’re experiencing self-sabotage. You want to do something, but somehow you’re doing something else compulsively, and you hate the effect it has on your life. These old programs can control you as long as you haven’t brought them to your consciousness and reprogrammed them. Once you have learned to do that, you’ll wonder why you haven’t done that sooner. 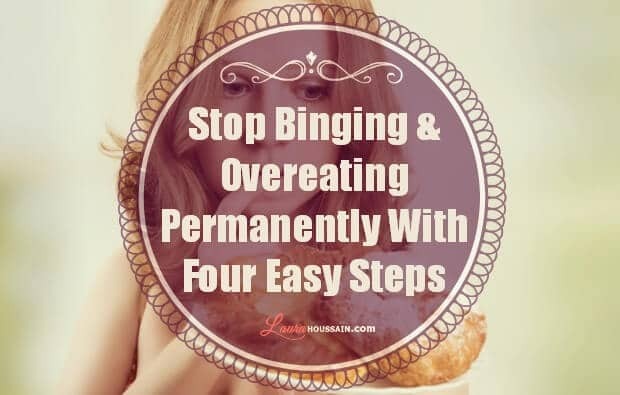 It’s the easiest and fastest way to stop binging and overeating compulsively. Now, every time you sense your compulsive patterns, you seize the opportunity to dig out more limiting thought patterns and change them. It’s a very empowering experience. It can take minutes not months, and you never have to feel any pain in the process. Master your cravings: I give my newsletter subscribers great free tips on how to do so. Cravings are quite easy to stop once you know how so don’t miss out on the opportunity to learn how now. Subscribe to my newsletter using the form below. Observe and accept your compulsion: Now that you can master any cravings, you are more relaxed about them, and you can take the time to observe your internal processes when you obsess on food or experience strong cravings. When you get the chance, sit comfortably in a chair, take three deep breaths, and put your hand on your heart and focus. After a while, you should start feeling a bit more relaxed. Now look at yourself in the middle of a craving or food binge. Ask yourself questions about what was happening in your head at that moment. What were you thinking, and feeling? What was the feeling you were trying to avoid? This process may take some practice and fine tuning, but you are certain to discover that you didn’t feel like food but something else. Maybe you needed to feel reassured, powerful, heard…. Now try to sink a little deeper and ask yourself: What beliefs was I acting out? For example, I realized at some point that I believed I couldn’t find a good, strong man I could love who would love me back. I was dating someone who just couldn’t get involved with anyone seriously, and who still can’t today, and I was making it a story about me and my ability. I then looked at the story I was telling myself, realized I had created a myth out of single events, wrote down those beliefs, and let them be. My compulsive behavior was gone for the day, but I wanted to make the results permanent. Create new beliefs about yourself: There are numerous ways for doing so. Repeating affirmations in a trance state is what works best for me. Trance can happen when you’re deeply relaxed. Your mind then becomes receptive to new ideas. So here are the steps: Learn how to stop cravings fast, uncover hidden beliefs that are controlling the way you eat, create affirmations to erase those beliefs, and create more supporting ones. It’s quite simple to do and doesn’t require you to spend countless hours in therapy. Actually, I don’t like to keep clients long. I like to help them empower themselves. If you try these techniques long enough, you’ll never be afraid of your cravings or food obsessions again. You’ll just learn how to take control of your mind. Food will nourish you, and you’ll be able to lose weight and take back the power in your life. Please let me know how it goes in the comments below.